This boy’s birthday camping party is a great theme for old-fashioned fun right in your very own backyard. Homespun Hostess, Sara De St. Jean, threw this version for her nine-year-old son—and everyone loved the celebration ideas! Decorations were based on a rustic campground look, so supplies could be easy to track down. The invitations look like a retro camping park admittance ticket. The cake looks like a tent on a hill. The party looks like fun! Maggie Russo Photo has captured images of Camp Tyler so you can glean ideas for your own backyard bash. 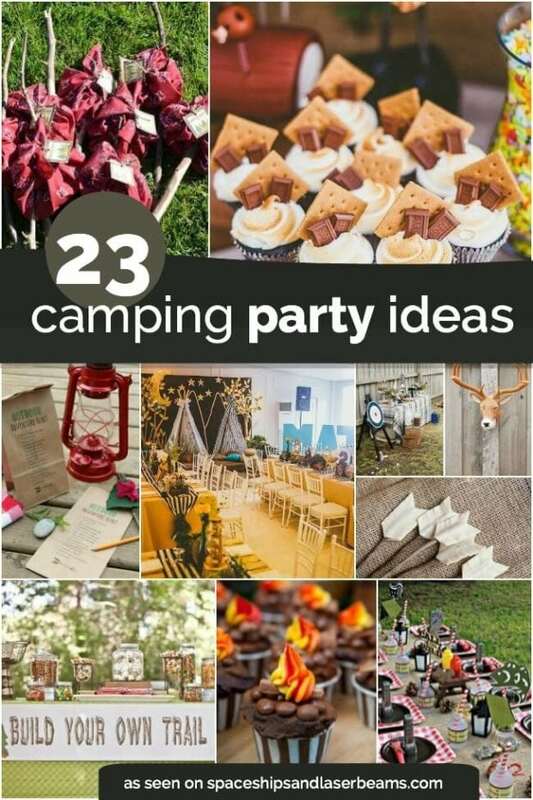 Give your decor a bright pop of color with this modern camping party. Take a step back in time with this camping party. Check out these delicious campfire meals. These camping hacks are everything you need to know! I love how Sara welcomes party guests: there’s a simple “Welcome Campers” sign, but notice the marshmallow on a stick? Clever! Water bottles, tally sheets, and flashlights wait in baskets ‘til they’re needed for a nature hunt and a game of flashlight tag. A tent with a “Camp Tyler” banner adds a lot to the decorations. Birthday boy looks happy in his custom t-shirt! A classic masculine plaid in tan, green and blue covers the dessert table. Logs, pine cones, a large thermos jug and lantern visually reinforce the camping theme. A three-tiered basket holds ingredients for the s’mores — it wouldn’t be a camping party without them. The star of any birthday table is always the cake and this Texas chocolate delight by Little Miss Sweet Tooth carries out the camping theme. A log slab holds s’more brownie cake pops; cupcakes with medallions and waving birthday banners and “roughing it” treats will satisfy sugar cravings. The main food table uses lots of texture for an outdoorsy look. Burlap, labeled baskets and moss look terrific here and have been partnered with more logs and a woodland critter. Cattails and a canning jar of bare branches are an amusing way to add rustic atmosphere. Chili, chips, and hot dogs team with root beer in party sleeves to satisfy hungry guests. A backyard camping venue is a terrific way to party—the great outdoors, with all the comforts of home. Love this camping party? Get camping party supplies here gathered by the crew at Spaceships and Laser Beams.